I have experimented with all sorts of arts and crafts, from sewing, to crocheting and quilting, to cross stitching, to smocking, to stained glass. I have done papier-mâché ornaments and even attempted acrylic painting! But I never pursued these for very long because I didn't feel any of the mediums truly connected to my artistic self or even expressed my personal creativity. My artistic self was dormant and waiting to be expressed. So the search continued until 2007, when I attended an introductory class creating jewelry using silver metal clay taught by a local artist. This was an instant love affair! I found my artistic voice. I was hooked, and have never looked back. I am not formally trained as a jeweler. My creativity, long dormant, began to evolve, filling that small void in my completeness! The fundamental need to express myself using my God given gift or talent is blossomed. My creativity, my dreams fulfilled! Most of my creations have metal clay as its focal point. 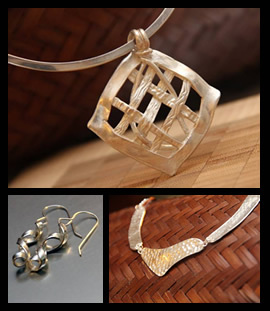 Metal clay is a clay-like medium used to make jewelry, beads and small sculpture. It consists of very small particles of metals, such as silver, bronze, copper, gold or platinum, mixed with an organic binder and water. Metal clay can be shaped and textured just like any soft clay, by hand or using moulds. After drying, it can be fired in a variety of ways including a kiln, or with a handheld gas torch. The binder burns away, leaving the pure, sintered metal. I am a member of Louisiana Craft Guild.